Fashion Icons – Part 2 | Oh, for the Love of Vintage! I collect dolls. Vintage Barbies, Revlon dolls, Jem dolls, Gene dolls, Nesting dolls – all kinds of dolls! I’m influenced in particular by the style and fashion of vintage dolls like early Barbies. In 1952, Lilli appeared in the German newspaper Bild-Zeitung. The comic was created by Reinhard Beuthien. Lilli was a gorgeous, saucy, buxom blonde who often played ‘cat and mouse’ games with her many admirers. 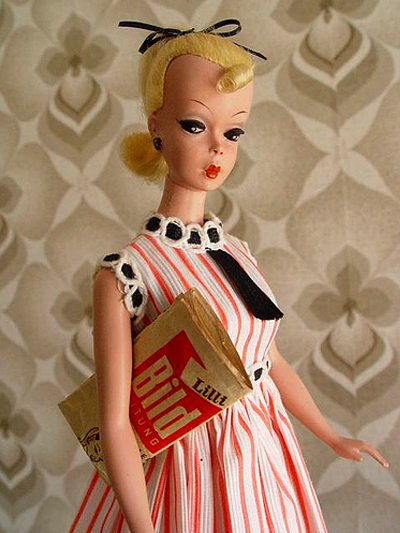 The comic character was very popular so in 1955 the first Bild Lilli doll was created. The doll was produced by the Hausser Elastolin firm (O&M Hausser) in Neustad and was designed by Max Weissbradt. The Lilli doll was originally intended for an adult audience and was sold in smoke shops. However, the doll became very popular with children and was later sold in toy stores. The Bild Lilli doll came in two sizes, 11 1/2 inches and 7 1/2 inches. One of the things that I love about Bild Lilli is that she came with a Steiff poodle! Boy, is she ever a gorgeous doll! It’s very obvious who Mattel doll creator Ruth Handler modelled Barbie after. One only has to compare a Lilli doll to a 1959 ponytail Barbie to spot the copycat. Meow! In the early 60s, the O&M Hausser company attempted to sue Mattel for patent infringement (as did the Louis Marx and Company who also owned Lilli rights). Sadly, the O&M Hausser company lost and a few years later sold Bild Lilli to Mattel. Once Mattel owned Lilli, they stopped manufacturing the doll and Lilli ceased to exist. 😦 Bild Lilli died and was taken over by her knock-off, Barbie. Sadly, Lilli has since gone down the memory hole. Forgotten or unknown by most. However, doll collectors like myself still love Lilli. May the original fashion doll icon LIVE ON! Note: Bild Lilli dolls are extremely collectible and sought after. If you own one, consider yourself lucky as the original dolls sell for in the thousands! Wow, thanks for sharing! I’m german, but I didn’t know about Bild Lilli so far.The Steiff poodle is so adorable! Cool story. Now I feel bad for ripping my sister’s Barbies apart as a little kid. Wow, I´ve never heard of that before. some of her outfits are very cute! Glad you enjoyed the post everyone! I too could stand to look more like Lilli..ha ha! Pingback: Fashion Icons – Part 3 « Oh, for the Love of Vintage! You got a Lilli doll Lise? yes..now i am looking for some orginal clothes!! I stumbled upon your conversation about Lilli while doing a little research on her. I acquired an original in near mint condition that I’m going to be parting with. Any interested parties, shoot me a message.